Florida rentals experienced strong price rises during 2018 with three metro areas ranking in the national top six. Increases in house prices and interest rates along with a strong economy mean that 2019 should see more of the same making it another good year to invest in buy-to-let in Florida. 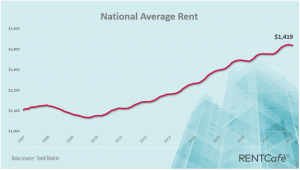 Figures published in the Rent Café annual report show that rental rates rose nationwide in 2018. On average, monthly payments went up by 3.1% in the year to reach US$1,419. Rent Café attributes the strong rental market to two main factors. The US economy performed well last year with buoyant job creation resulting in more demand for housing. Mortgage interest rates also rose meaning that buying a home became more expensive. As a result, rental properties became the only viable option for many Americans. The increases in rents weren’t uniform, however, with those in some metro areas standing well ahead of others. Las Vegas saw the biggest rises with rentals 7.9% higher at the end of 2018. Phoenix in Arizona came a very close second with an increase of 7.7% throughout the 12 months. When it comes to states, however, Florida rentals dominated the top six listings. As the Rent Café report says, “Florida rental hubs were in close competition” with Las Vegas and Phoenix in 2018. Three metros in the Sunshine State took fourth, fifth and sixth places in the national rankings. Rental properties in Jacksonville experienced a 6.3% rise last year, over double the 3.1% seen nationwide. The increase brought average monthly rates in the city to US$1,059. Next was Orlando where rentals went up by 6.1% in 2018 to an average of US$1,389. Completing the hat trick was Tampa with an increase of 5.4%. Rent Café analysts expect the trend to continue this year. Commenting on the figures, Doug Ressler, Director of Business Intelligence at Yardi Matrix said, “Healthy job creation, a robust economy and positive demographic trends are promoting the formation of new households and stimulating demand for rentals”. The Rent Café report anticipates further growth in demand for rental properties throughout 2019. This forecast in tandem with the high increases in rates for Florida rentals last year auger well for buy-to-let investors, particularly in the hot spots of Jacksonville, Orlando and Tampa. The report also analysed the most sought-after rental properties in the US last year. In tune with the rising cost of housing, the term “cheap apartments” accounted for over a quarter of online searches for rentals in 2018. “Studios” came a close second with almost 24%. Other popular search terms for people looking for Florida rentals included “1 bedroom apartment” (10.48%) and “2 bedroom apartment” (9.46%). Would-be tenants also added “luxury” to their must-have list. Searches including this term rose to 7% in 2018.